Hats bound for Washington, D.C. I first heard about this initiative through my machine knitting guild, which meets at the Unitarian Church in Lincroft, N.J. A group of 100 people is going to Washington, D.C. on Jan. 21 and the plan was to donate hats to them in gratitude for hosting the guild. 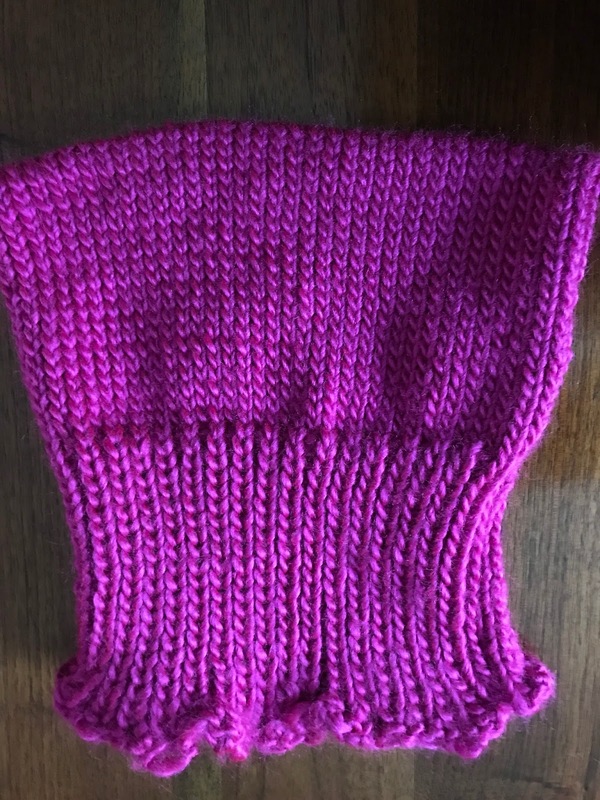 I immediately downloaded the Pussyhat Project pattern and went to A.C. Moore. I did not purchase the yarn in the pattern as I wanted to donate as many hats as possible and the outlay would be a bit high. The pattern is worsted weight yarn. The color? Pink, of course. 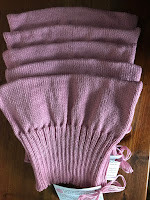 I bought three skeins of Caron Simply Soft yarn and one of Lion Brand Landscapes and went home to figure out how to knit these up as quickly as possible. My main knitting machine isn't suitable for yarn at worsted weight. First, I set up the Simpleframe and knit the first hat. 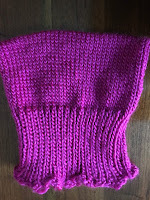 Because I was learning how to use the little manual knitting frame, the ribbing tension was awful on the first section. You won't see that hat because I frogged it. Then I set up the single bed LK150, which I can carry to workshops, and did tensions to figure out how to make a hat the size of that in the pattern. 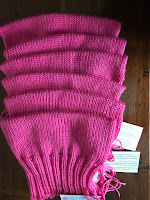 I made six hats from three skeins of the Caron and one from the bulkier Lion Brand acrylic yarns. Should you think this was a super-quick knit, don't be deceived. Faster than on needles, surely, but a real pain in the you-know-where because of the need to hand manipulate all the ribbing--as in, un-do and ladder up the stitches. My Passap DM-80 is a masterful knitting machine. And it is double-bed, which means it can knit rib. No. It doesn't knit all by itself. It doesn't finish itself, either, but it certainly speeds up the repetitive knitting bits. I tried knitting a hat of my single ply handspun wool (Polwarth) and I loved it. Next, I ordered a one-pound cone 3/8 sport weight yarn from a Vermont company that makes hats. And I proceeded to knit! I got five hats from the cone. Then on to finishing the hats. Minimal, sure, but still a couple of evenings seaming up the sides and weaving in the yarn ends. 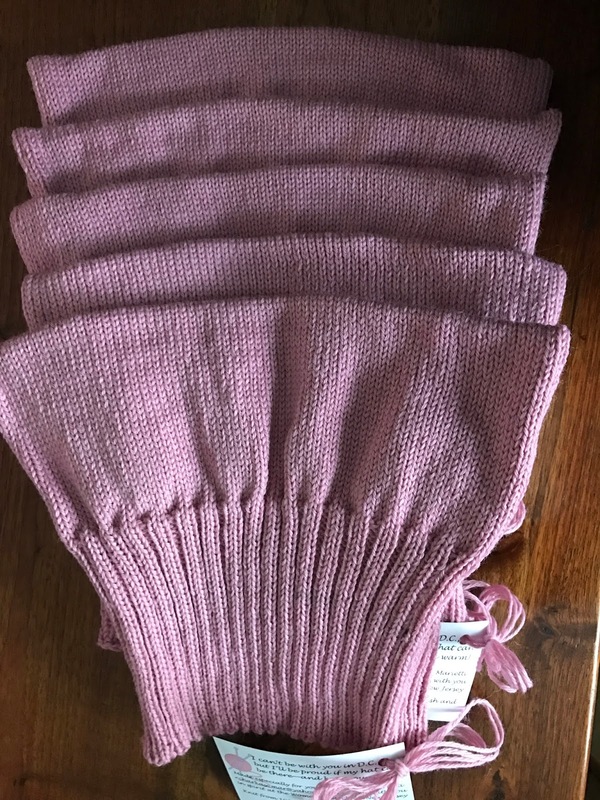 The seams on the sides of the hats, which are rectangles with ribbing on each end and stockinette in the middle, provide enough substance to allow the corners to stand up. As in cat's ears. Got it? I'm out of yarn, but have 13 hats for distribution. Four are in today's mail to the church and nine go to my lovely daughter-in-law, who will distribute them among her group from Zeno Mountain Farm. I found your hats on Ravelry. They are great and thank you for knitting hats! You're right. It's a simple pattern but it still take a bit of work.